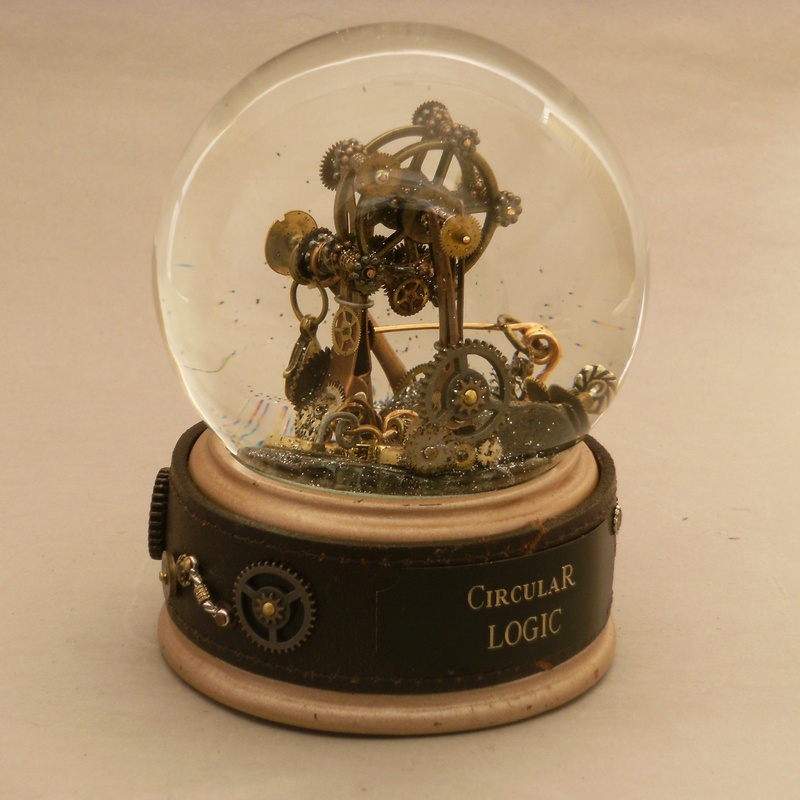 Keeping with the theme of unpredictable globes, non-traditional, quirky and sometimes downright odd, we didn’t see a need to create a snow globe that had been done a thousand times before. There are plenty of places you can find a holiday-themed snow globe, you don’t need us for that ordinary task. But … we started a tradition last year, by request. 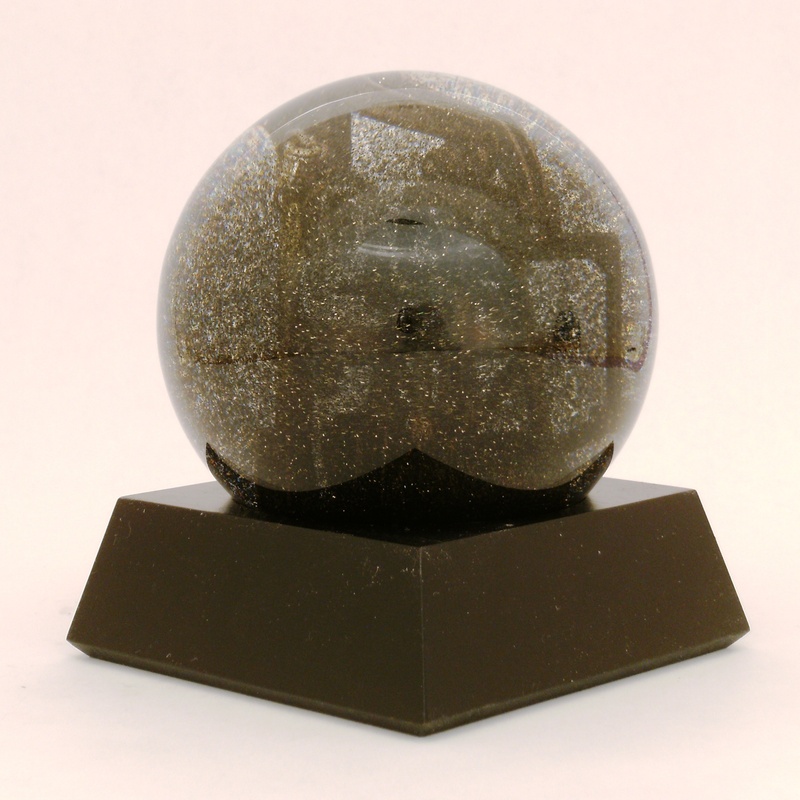 We create one quirky version of a holiday snow globe, just for our own demented joy. This year, it’s Twisted Santa. Santa’s not twisted, as in demented, he’s twisted in that his beard and other details are all made from hand-twisted silver wire, right down to the curlicue eyebrows. 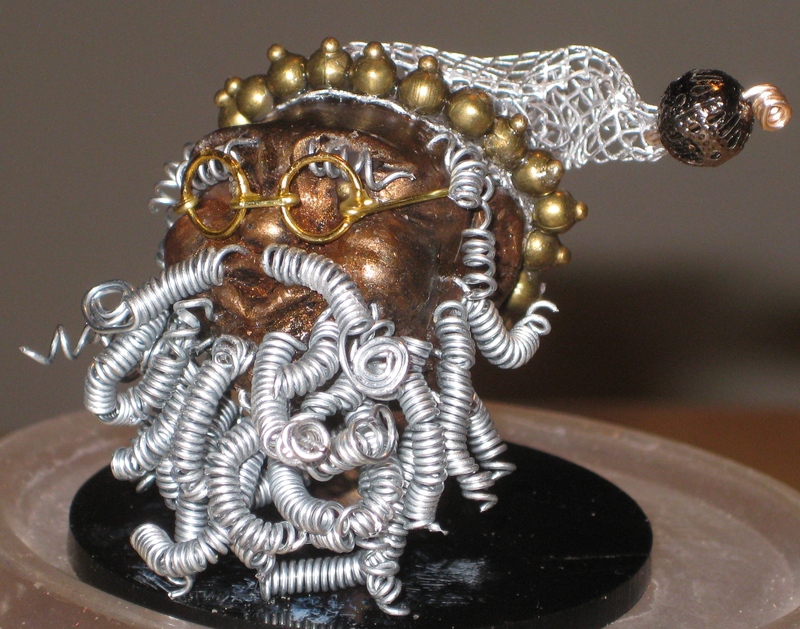 The tiny gold rimmed spectacles are made from jump rings, and the airy santa hat is created from bendable sculpture wire mesh. Santa’s face and head are sculpted from clay, the base is painted wood finished with a leather reindeer collar and jingle bells. Yes, when you shake the globe to see the shimmery silver snow goodness flutter about, you’ll hear sleigh bells at the same time. 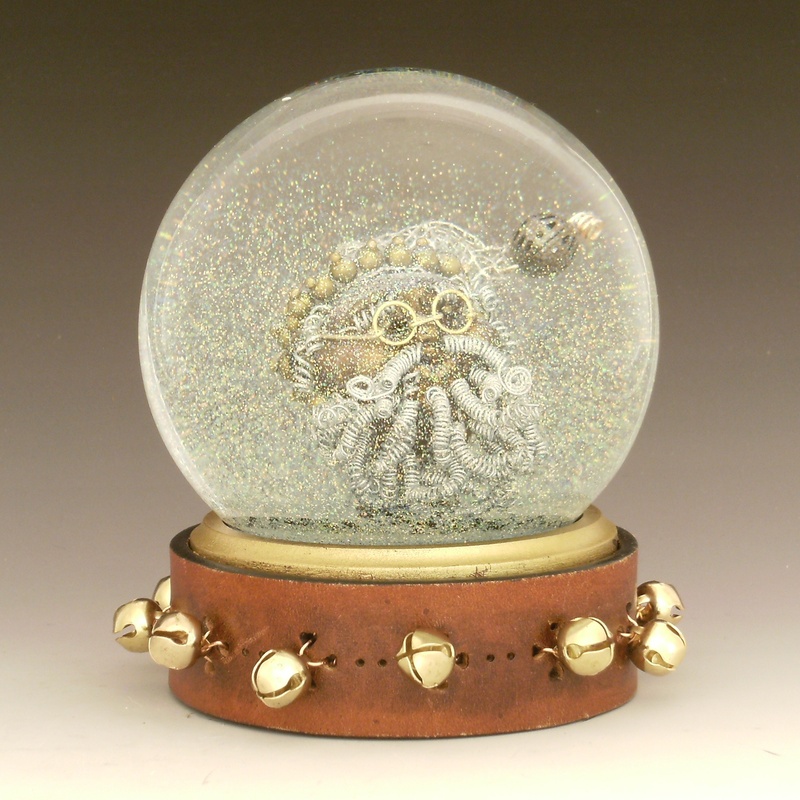 Twisted Santa, one of a kind custom snow globe. All images and designs copyright (c) 2014 Camryn Forrest Designs, Denver, Colorado, USA. The word that comes closest is yearning. It’s that feeling that there is something powerful, just out of reach, something you can almost touch. when every cell in your body, every hope and dream, every piece of you stretches beyond what you once thought you could do. When you reach for the impossible, anything can happen. 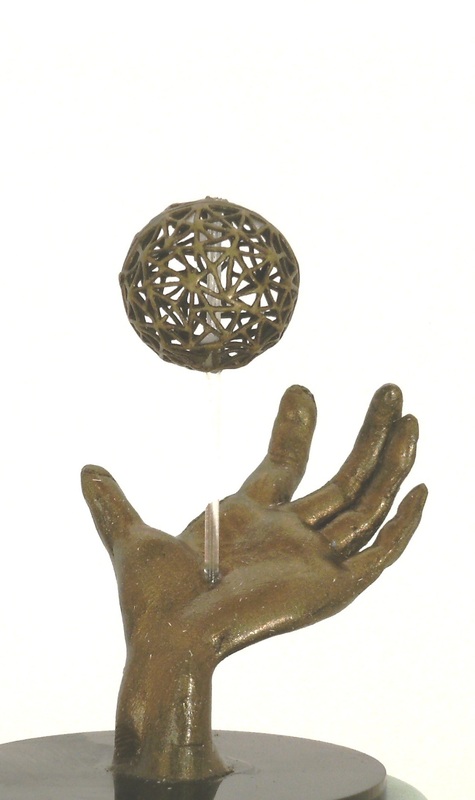 “Reach” – one of a kind snow globe/waterball with sculpted hand and repurposed metal ball, gold glitter and liquid. All images and designs copyright (c) 2014 Camryn Forrest Designs, Denver, Colorado. Ooooh! It was a dark and stormy night. Mystery snow globe. A Black Snowstorm. A riddle: What’s thick and black and swirling with potential? What? A steam-powered oil derrick? Isn’t that a contradiction, she asked, in a concerned voice. Or, maybe it’s deiselpunk, she offered helpfully. It’s both, it’s neither, it’s not meant to be political commentary. It was just a passing thought — like asking a human to program a computer which will soon replace its job. Was steam ever asked to help find the oil that would fuel combustible engines? If you are looking for reality, you might have to look a little further down the road. Maybe even a different road. 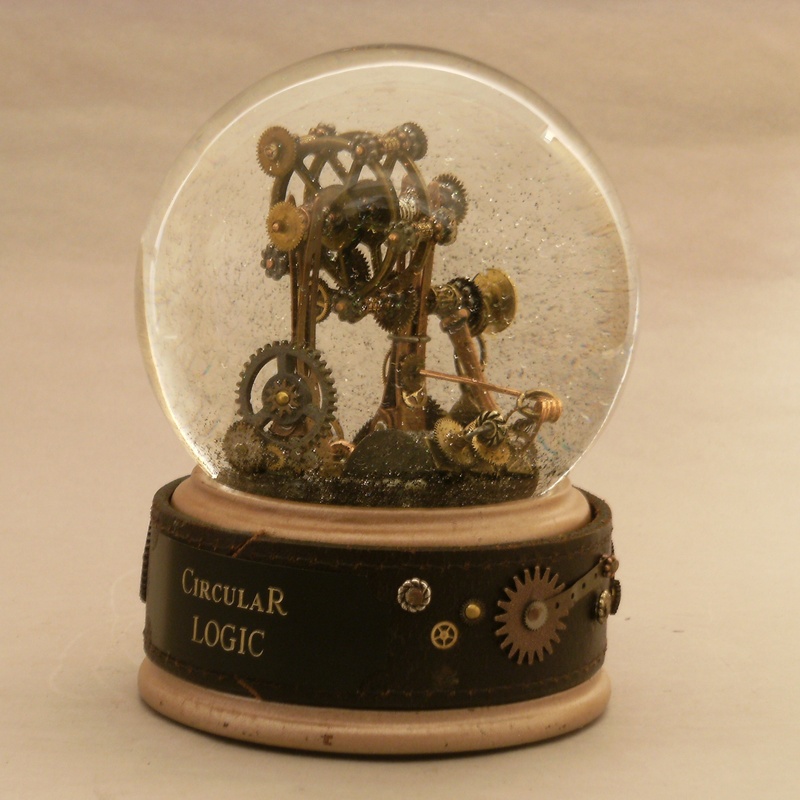 Steampunk is a fantasy bred of rethinking the past to create an alternate future; it’s not real life. And neither are steam-powered oil derricks. But I was enchanted with the idea of mixing it up, you know: Oil and Water. From the land of pleasant contradictions and happy contrasts (with a sidetrip to the village of groan-able puns), I give you: Oil Well that Ends Well. 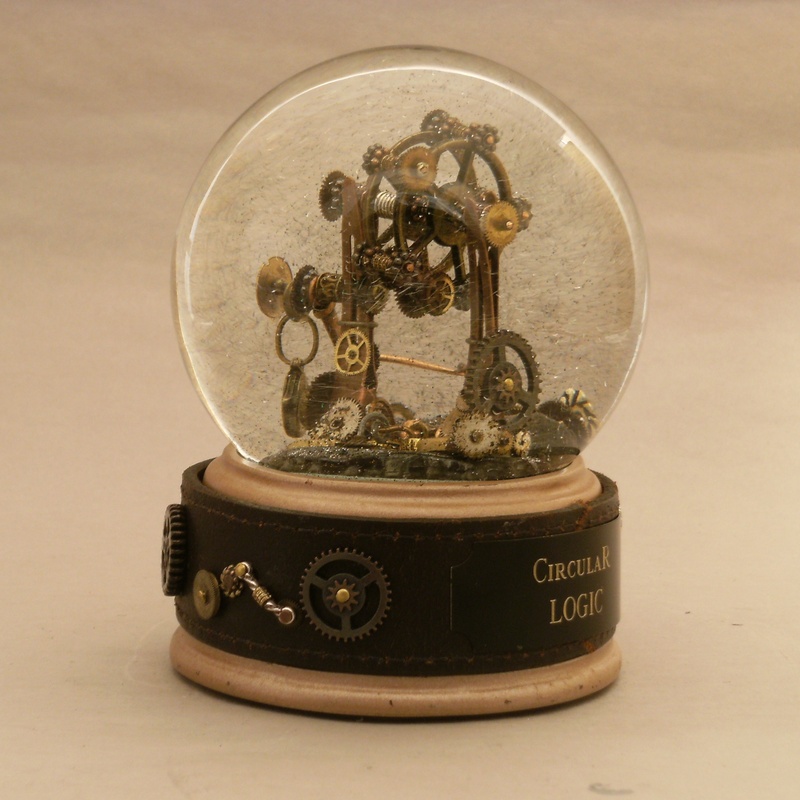 Oil Well That Ends Well, custom snow globe with miniature oil derrick “curious invention” in deep black sooty dust (when shaken) by Camryn Forrest Designs 2013. All designs and images copyright (c) 2013 Camryn Forrest Designs, Denver, Colorado. has made a round trip. at the Sandwich Glass Museum. Given its name, it’s a fitting journey. One definition of Circular Logic is that the answer contains no evidence that is distinct from the conclusion. Circular logic cannot prove a conclusion because, if the conclusion is doubted, the premise which leads to it will also be doubted. After a lot of trial and error, this is certainly true of this piece. The curious invention appears to go round and round, but always begins and ends in the same place it started. The conclusion is the same as the premise. and continues in its endless, and meaningless, journey. Always a round trip. Of course. A fragile glass heart, encompassing red foil details, rises above the fray of broken fences, chains, the gentle swirl of soft gold dust and industrial refuse.